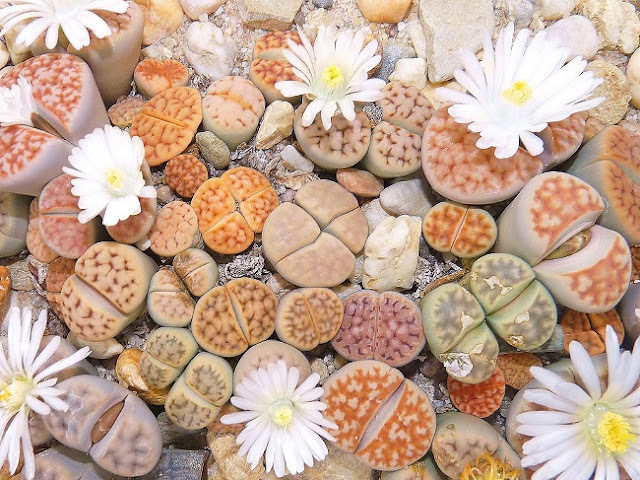 Lithops plants, perhaps more commonly known as 'Pebble Plants' or 'Living Stones', are a fascinating succulent plant native to wide areas of Namibia and South Africa. They are found in elevations from sea level to high mountains, with individual populations covering just a small area of dry grassland, or bare rocky ground. 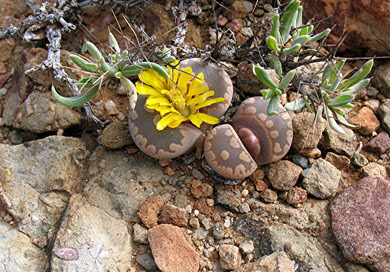 Each Lithops species is found in in its own particular environment, usually restricted to a specific type of rock. Despite this specialisation to specific environments, Lithops are relatively easy to grow if given sufficient sun and a suitable well-drained soil. If they do not receive enough direct sunlight your Lithops will etiolate (grow slender and elongated), lean towards the available light and lose colouration. When growing Lithops as house plants, the better you can mimic their natural habit the more successful you will be. Newly purchased plants can be potted on into 7-9 cm pots using either a proprietary cactus compost or make your own using a mix of equal parts by volume John Innes 'No 2' potting compost and horticultural grade grit-sand. Position the plants in the soil so that about three-quarters of the height of the plant remains above the soil level. You can add grit or fine ornamental gravel to the surface of the pot to ensure that the 'neck' of the plants remains dry. Water Lithops with a fine mist sprayer, or a small watering can fitted with a fine rose. 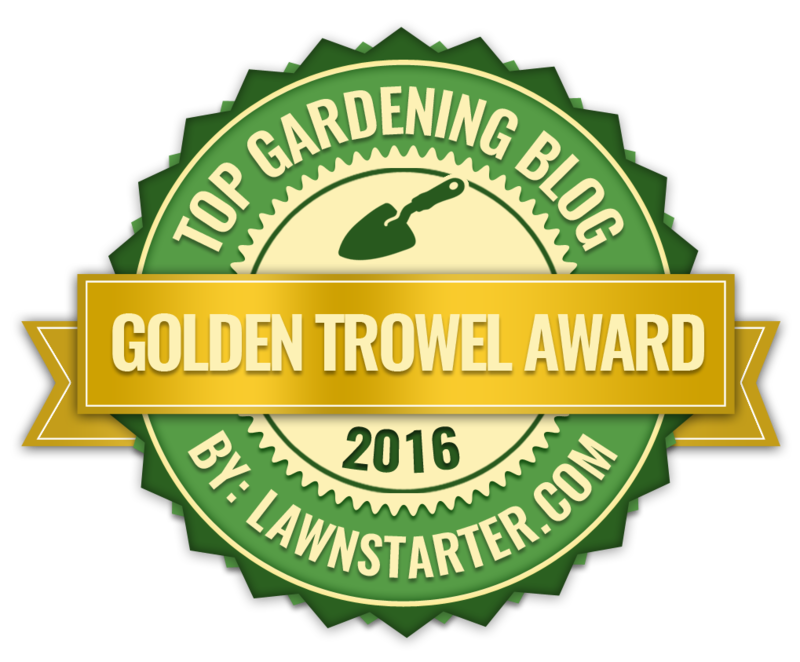 Never allow the soil to become waterlogged and always allow the surface of the compost to dry out between waterings. 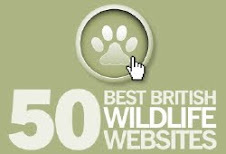 As a rough guide, this can be once a week during the spring and autumn. Do not water during the summer or winter months or when the old leaves are being replaced with new. It is important never to overwater as this can cause the plant to become bloated and may cause rot roots. 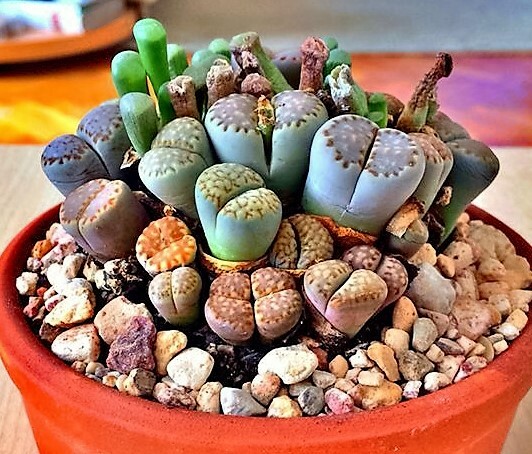 Be aware that Lithops have a definite rest period from the middle of October until May (northern hemisphere), during which they should not be watered. In its native habitat, the thick, succulent leaves have evolved to store enough water for the plants to survive for months without rain. Periodic watering generally begins from early to mid-August for most species and then again in the Spring. Provide a minimum winter temperature of 5 degrees Celsius and maintain maximum light levels throughout the year. During the year the leaves will start to wrinkle, at which point you also withhold water. There is no need to worry as this is perfectly natural so do not do the opposite and increase watering! A new pair of leaves will appear between the old ones and will increase in size as the old ones finally shrivel away. Once the old leaves have completely dried up you can commence watering again. Lithops will usually need to be al least three years, sometimes up to five years old, before they are mature enough to bloom.